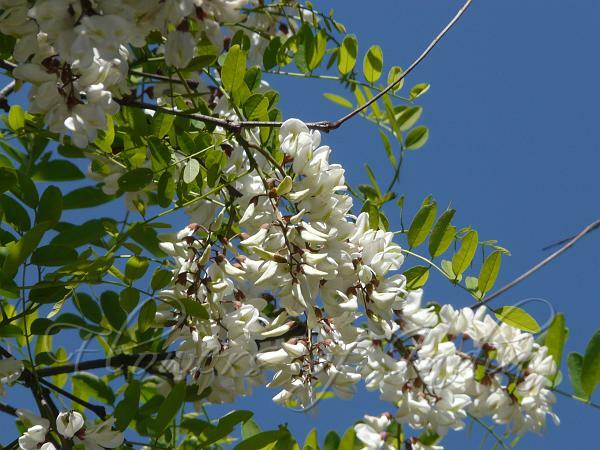 White Locust Tree is a deciduous tree that grows to 14–25 m tall, with a trunk up to 0.8 m diameter, with thick, deeply furrowed blackish bark. The tree is native to North America, introduced and widely cultivated in Europe. It was probably introduced in India by the British while developing the hill stations, where it is now seen. The leaves are 10–25 cm long, pinnate with 9–19 oval leaflets, 2–5 cm long and 1.5–3 cm broad. Leaflets are rounded at both the ends and notched at the tip. Each leaf usually has a pair of short thorns at the base, 1–2 mm long or absent on adult crown shoots, up to 2 cm long on vigorous young plants. The intensely fragrant flowers are white, borne in pendulous racemes 8–20 cm long, and are considered edible. The fruit is a legume 5–10 cm long, containing 4–10 seeds. The species name pseudoacacia means false acacia. The name locust is said to have been given to Robinia by Jesuit missionaries. The Bible tells the story of how John the Baptist was kept alive in the wilderness by eating 'locusts', which were not the insects, but the pods of the Carob tree, which have some resemblance to locusts. 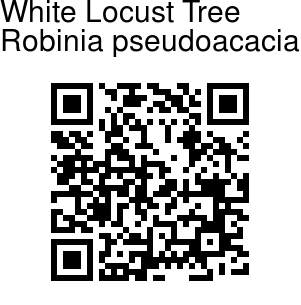 When the Christian immigrants discovered Robinia which has roughly similar pods, they were also called Locust tree.